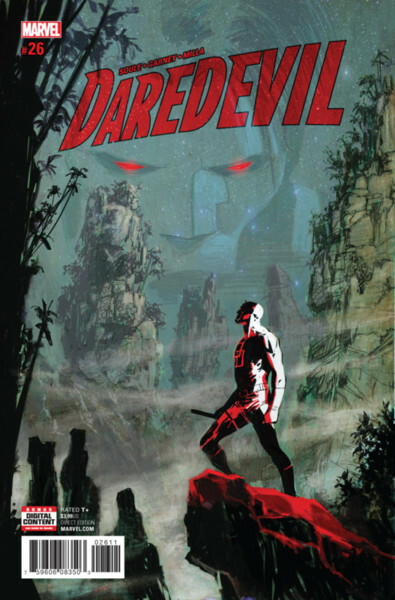 What did you think of DAREDEVIL #26? Please use this thread for all discussion for the first issue of "Land of the Blind"
It's kind of touching that Matt visit's Blindspot's shrine and takes up the causes of those asking Sam for help. I enjoyed how he has to go to visit Sam's sister because the messages are written in Chinese. I liked it better when Matt was in the doghouse at work, maybe because it gives the character another struggle to overcome. I'm sure his good fortune won't last. I even think Ellen King may have romantic feelings for Matt, so there may be an office romance in the offing. Here's another curious story omission by Soule: Just as he set up a ton of legal drama in his "Supreme" story only to skip over most of it, he sets up a legal struggle at the Chinese airport. He even has Matt think, "I live for this." Then we turn the page, and that struggle is skipped over. Why set us up for a scene we're not going to get? What is the point of that? Stop doing that Charles! The rest of the issue is fine. We have an effective cliffhanger which has me eager to carry on with the story. We have a potentially interesting monster which excretes goo from its eye sockets, seemingly sucking the life-force from its victims. I think that could have been shown more clearly. I don't even know if the victim died. Overall, I gave this issue a four. It's good to have Ron Garney back on pencils, even if he seemed rushed at times. I'm happy that the black costume has been retired. Is it also retired in the Defenders series I'm not reading? The story starts off with an exploration of the consequences of the last arc. Soule rightly points out things aren't going to change overnight. It's a realistic way to ground the story while also not overhauling the Marvel universe. I like that he's reading all the messages for Blindspot. His sister has a point. He's dealing with symptoms by beating people up, but it's really just dealing with his guilt. However, all that changes when there's a message from Sam himself. I'm fine with Matt going to China. I appreciate that he's going in better standing with the DAs office. I hate that there's essentially no supporting cast worth mentioning there. Garney's art is as good as it's ever been. I love seeing Daredevil in his old suit. The early pages with Daredevil talking to Blindspot's sister look gorgeous. Same with the mountain scenes later. This may be my favorite art of Soule's run. Either this or some of the stuff with Muse towards the end. I like this issue. I'm not necessarily thrilled with the choice in villains because they're fairly overused, but I still think this could be a lot of fun. Four and a Half Stars. I'd push this closer to five as well. I think the biggest problem is a few moments are kind of brushed by very quickly. It's a very fast-paced story. God, I am so glad to see the Hand again and I cannot wait to see what happens next. I love the Hand when they are written as a threat, which probably hasn't been the case probably since they forced Stick to kill sacrifice himself lol, but I'm optimistic. I was so bored by the last arc and the artwork was atrocious. This issue is great on so many levels. Maybe this might actually make me be interested in Blindspot. I liked the idea of Daredevil having Blindspot as a sort of protege, I'm glad to see him back (not so sure Matt is at this point). The Garney art was great, of course. I'm actually fine with Soule skipping the boring lawyer stuff this issue. Can't we all just assume by now, that Matt knows his law?! I took it as sort of tongue in cheek. I gave it four stars... The art, the story... and for goodness sakes, that cover was beautiful! I'm actually fine with Soule skipping the boring lawyer stuff this issue. Can't we all just assume by now, that Matt knows his law?! I took it as sort of tongue in cheek. I would agree with you if Soule hadn't set us up for a scene with the Chinese lawyers. I think by having Matt think, "I live for this stuff," it requires a scene of some sort displaying Matt's legal acumen, even a short one. Soule didn't have to plant that set-up. Soule keeps doing this. He built up all this hype about how awesome Legal was, and by the story's end, we didn't see Legal do anything awesome. Soule may have a problem. This issue is OK. I expected Blindspot's return to be problematic the moment we learned (some issues ago) that he was taken into custody by his mother (who was revealed to be one of the top lieutenants of the evil mystic chinese crimeboss of the first storyarc). The part with Blindspot's sister was good and gave some background to what happened while Blindspot was still Daredevil's protege. I'll wait to see where this is going.. not really a fan of stories involving the Hand. We'll see.